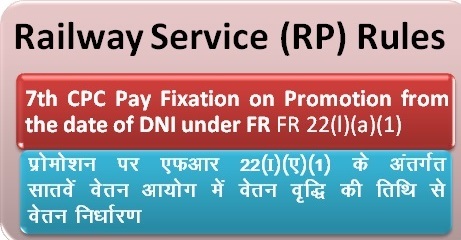 Sub: Availability of option for fixation of pay on promotion from the Date of Next Increment (DNI) in the lower post and method of fixation of pay from DNI, if Opted for, in context of RS(RP) Rules, 2016 regarding. 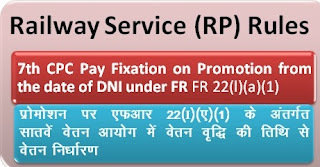 Consequent to implementation of 7th CPC recommendations, various doubts have arisen over the issue of relevancy of provisions of FR 22(l)(a)(1) as well as the methodology of fixation of pay on promotion to a post carrying duties and responsibilities of greater importance, of a Government Servant in case he opts for pay fixation from the Date of Next Increment (DNI). 3. The clarifications issued by MoPPG&P/DoP&T vide their OM. dated 27.07.2017 will be applicable mutatis mutandis in Railways w.r.t. RS(RP) Rules, 2016.